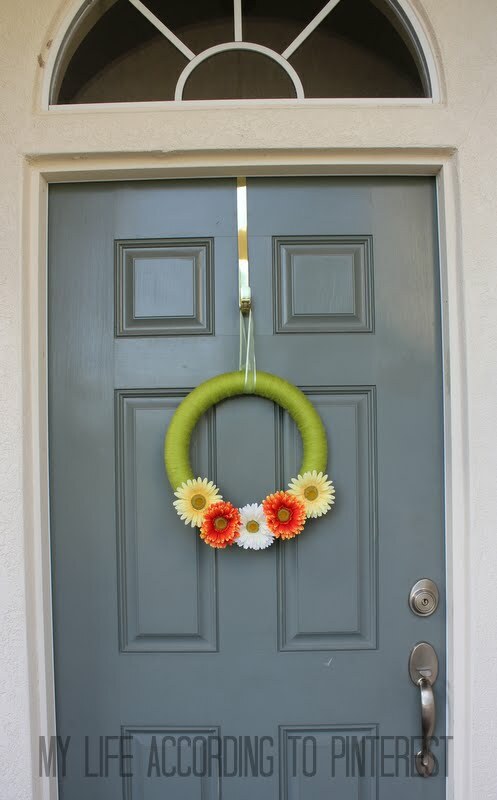 This wreath is so so easy to make. Plus, it's super easy to personalize for your own tastes and color scheme depending on what you love. I originally found this idea on This Girls Life. You only need a couple of things: Styrofoam wreath, yarn, silk flowers, hot glue gun, and ribbon. I used the Effervesce Yarn. It seems extra soft and kinda gives the wreath a soft fluffy edge unlike plain yarn. Basically all I did was wrap my yarn all around the foam wreath. I did this in small sections. I actually didn't use any glue when I did this until the very end. I would just wrap the yarn around the end pieces to keep them in place. That kept this looking nice and clean. I hot glued the last piece on the back of the wreath. Then, I hot glued the flowers in place where I wanted them. Last, I found some matching ribbon that I already had and made a hanging loop around the top of the wreath to hang it on the door. It's seriously that simple. 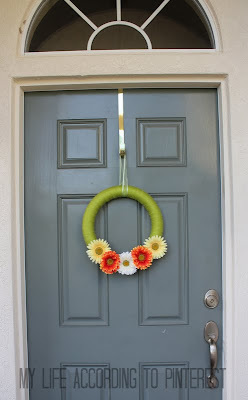 You can make this wreath what ever you want by changing up the yarn colors and flower choices. So, go spring up your door!